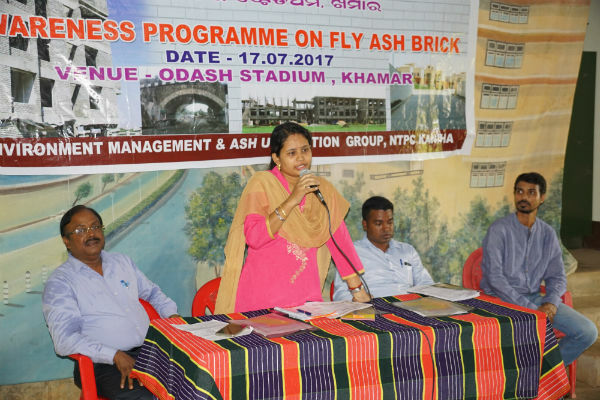 Kaniha: An awareness programme on Fly Ash Brick was organized by NTPC Talcher Kaniha at Odash Stadium, Khamar on 17.07.2017.The programme was chaired by Suman Minz, Addnl. Tahasildar Pallahara in august presence of Smt. Rashmita Priyadarsini, SPCB Official, Angul Regional Office and Shri A.K.Kamilla, AGM(EMG/AU),NTPC Kaniha. Addnl. Tahasildar, Pallahara Suman Minz, speaking on this occasion shared the benefits of use of fly ash brick and impact of clay bricks on environment. In his brief talk, he emphasized on the use of fly ash brick in construction activities. 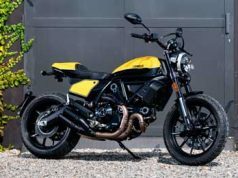 Dy. Engr, Odisha State Pollution Control Board, Angul Regional Office ,Smt. Rashmita Priyadarsini, elaborated on the advantages of fly ash brick in respect of its cost effectiveness and quality. She stressed on manufacturing bricks according to BIS in order to maintain quality of the bricks and to gain confidence of the users to opt for ash bricks instead of clay bricks. On the occasion, Shri A.K.Kamilla explained the benefits of fly ash bricks over clay bricks in detail. He also emphasized on the conservation of top soil by avoiding use of clay bricks which leads extraction of soil. In place, fly ash can be used which being a pollutant can be converted to a product by manufacturing ash based products. 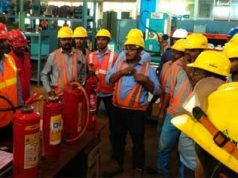 The programme was attended by fly ash brick manufacturers, brick users as well as masonry workers.Participants who have used fly ash bricks shared their views on their experience.Participants queries were clarified by the guests regarding the longevity of the ash brick as well as its strength. About 120 persons participated in the programme.The programme was appreciated by the participants. Shri S.S.Pradhan who summed up the whole session, spoke at large on certain information for those who want to set up ash brick plant.The meeting was concluded with vote of thanks.